Now that you’ve self-published your book, all you have to do is sit back and watch the sales roll in—right? Wrong! Your book will be competing with thousands of other titles in your genre. If you want to build sales, you need to make your self-published book stand out and grab your audience’s attention. A good marketing strategy is key! 1. Identify your audience and keep that readership in mind for every aspect of your marketing plan. What do they want to see, hear, or read? 2. Define your brand. What sets you or your book apart from the rest? Incorporate your brand in every aspect of marketing. 3. Identify your genre. This will make it easier for readers to find your book and easier for Amazon or Barnes and Noble to categorize your book correctly. 4. Choose a dynamic book cover design. Learn more: How To Design A Book Cover To Boost Sales. 5. Write a compelling back cover book blurb. The first thing that catches a reader’s eye is your book’s title and cover. The second? A blurb that makes a reader want to learn more. 6. Get creative! Use fun activities, giveaways, or contests to promote your book. 7. Network. Join writers groups, attend bookstore events, offer to do a reading at your local library or book club, maybe even contact a local radio station and offer to do an interview. Get in touch with anyone you know who has connections in the media or the publishing industry. 8. Request reviews. Ask satisfied readers to leave reviews of your book on Amazon, reach out to book bloggers, or get an outside review. 9. Make the most of social media. Use Twitter and Facebook to connect with your audience. Make regular, meaningful contributions—if your time or social media skills are limited, we can help with our Virtual Assistant Program. 10. Build an author website. (Or let Web Design Relief create one for you!) An author website acts as your virtual business card and is a great way for readers to get to know you…and buy your book. 11. Create an author promo dream team and find strength—and marketing power—in numbers. 12. Write another book! Having more books available multiplies your market exposure and builds name recognition. Plus, new books can generate sales for your older titles. For more articles and ideas to promote your self-published book, check out Web Design: Online Marketing And Promotion For Writers! 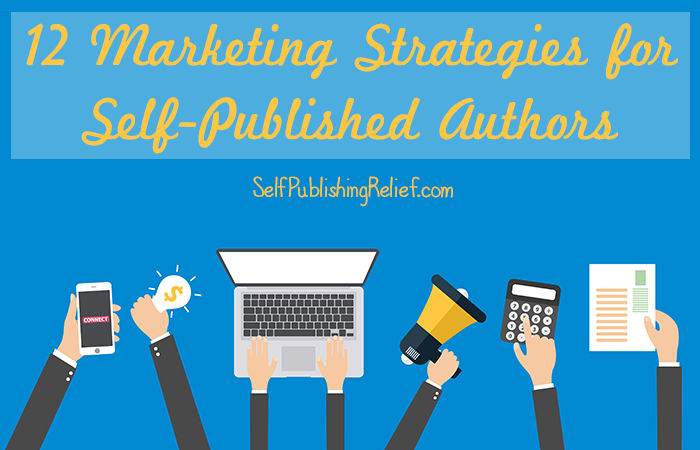 QUESTION: What has been your most successful marketing strategy for promoting a self-published book? ← How Should I Price My E-Book? Another idea: prepare to give away promo copies to key readers and reviewers! Always order some extras. Good advice. I especially agree with having a dynamic cover. Our books deserve great art! Great advise to a new comer writer like me . I hv written a novel and selfpublished it about 15 year ago but no idea to reach to large No of readers . After read your article am very hopeful to achieving my goal . I appreciate your advice, though I have not yet digested all that you wrote. I am going to print it out. That is me; I will devote time to digest it and then take steps to comply later.